When packing everything up you want to keep four boxes aside. You can use bags, cardboard boxes or plastic tubs - whatever you have. 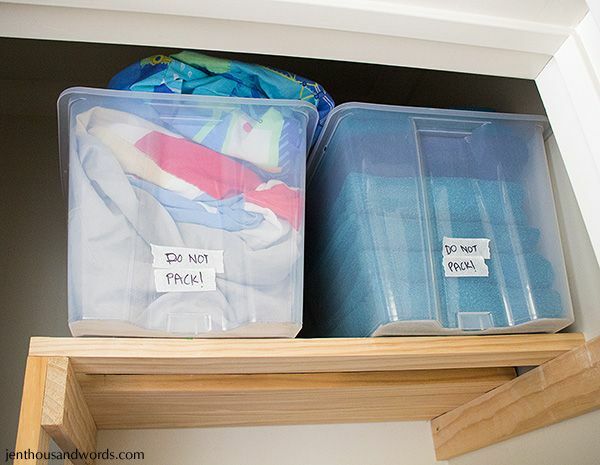 You want to label them "DO NOT PACK" and keep them somewhere accesible but out of the way. I've used my favourite plastic tubs from Ikea and I've stashed them on the top shelf of our linen cupboard. What do these boxes contain? The first holds a complete set of linens for each family member's bed (each set is folded and stored in a pillowcase). As soon as we arrive I can get the beds freshly made. I could do it before moving but we plan to just throw the pillows and duvets into the car and take them across, and they might get dusty or dirty in the process. I'd rather put fresh linens on in the new house. The second holds a complete set of towels and bath mats. The third box (not pictured) will contain all of our used-daily toiletries, hand soap and a roll of toilet paper. I can get the bathroom set up straight away for anyone who will use the loo and for showers at the end of the busy, tiring day. The fourth box (not pictured) will contain cleaning cloths, cleaning spray, our water bottles and snacks. If you don't know what the state of the house will be in then you might want to pack a more comprehensive set of cleaning supplies but we know that the house we will be going to will be cleaned before we move in so I'm just taking the cloths and glass cleaner, which I use for all of my basic cleaning (it cuts grease and doesn't leave residue). These boxes will go to the new house in my car with me. The first box will be unpacked right away when I sort the bedding out (which will probably be coming with me too), ready to set up the beds as soon as they arrive; the second and third boxes will be unpacked right away into the bathroom; the fourth box will sit on the kitchen counter for easy access. I've found that if you have these basics to hand and set up right away then the day goes smoothly and you can call a halt to your unpacking whenever you need to, ending the day with a shower and a fresh bed. Setting it up early when you are fresh and energetic is so much easier than trying to wrangle your bedding when you are exhausted at the end of the day, or rooting through boxes to find where the towels have ended up.